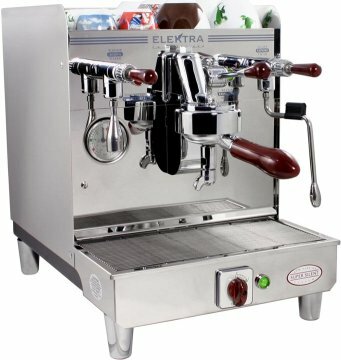 It's true, my admiration for Elektra's espresso equipment began as a "love at first sight" moment. From the ornate features of the towering copper and brass Belle Epoque series to the ultra modern Nivola, Elektra combines beauty, function, and capability in a compelling offering for discerning espresso aficionados. I've owned the Elektra Microcasa a Leva for a couple years as my "weekend" and travel espresso machine; it's so attractive that when it's not in use, the Microcasa is a decorative accent piece in our living room. The model A3 espresso machine reviewed in this guide is part of Elektra's Sixties Series. Functionally, it is a no-nonsense heat exchanger machine destined for small cafés. But its distinct styling is an attention magnet to anyone who enters the room. Elektra announces her presence unlike any home machine that I've seen. The evaluation model is the semi-automatic espresso machine shown below (that is, the barista lowers the brew lever to begin the extraction); the model T1 is the automatic equivalent with programmable dosing buttons, a feature which adds $150 to the purchase price. The casing is available in stainless steel as shown below, and it is also available in brass and copper or 220V models. The A3's dimensions are 13½" x 17" x 19½" (WxHxD). It's big. Is this machine a little over the top for your average espresso lover? You bet! For that reason alone, the idea of evaluating Elektra's one-group offering was enticing and nicely consistent with the site's motto, "Your Guide to Exceptional Espresso." So began an intensive four-month review process. UL and ETL installation certifications. And while not listed as a feature per se, did I mention that it's also gorgeous? The saucer-shaped grouphead is very reminiscent of an E61-like group in appearance, but Elektra's group is a proprietary design. The clearance beneath the group is an unbelievable 6¼" inches, the highest mounted group I've measured including the La Marzocco Linea series. While I really liked the added room and the extra light that it offers, Elektra's solution to reducing the "fall" that the espresso pour must endure is clumsy: The portafilters include 2½" cylindrical spout extenders, which I nicknamed "stilts." I tried to give them a fair trial, but in the end they joined my collection of el-cheapo plastic tampers and single baskets (I'll return to my preferred workaround in Espresso Performance). During most of the evaluation I used a bottomless Rancilio commercial portafilter to monitor the extraction quality. If you are a "naked portafilter" fan, note that the stock portafilter would not make an ideal candidate for "chopping" to make it into a bottomless because its bowl is rounded. Portafilters having bowls with nearly straight sides like the Rancilio commercial portafilter work best as bottomless portafilters (note that the La Marzocco portafilter does not fit the Elektra A3's grouphead). Having taken in all of Elektra's polished exterior, I wanted to look under the hood to see if its beauty was only skin deep. Removing only five screws—six if you include the controller splash cover under the driptray—revealed every serviceable part. The large copper boiler is perched in the middle of the machine and there is ample room for the pump, electronics, and plumbing. Should it be necessary, working on this machine would be easy without the risk of scraping your knuckles in tight spaces. I noted good choices in components like the commercial Sirai pressurestat, Procon rotary vane pump, and Gicar controller. It has nice attention to construction too, although not quite in the same league as the Cimbali Junior, which earned HB's perfect 10 for its materials & workmanship score. While I had the back off, I hooked up the water supply line, drain for the driptray, then carefully put the U-shaped back in place. Not to belabor the point, but when I stood back and looked at it again, I found it impossible not to admire the stainless steel buffed to a mirror finish and shapely woodgrain handles. Focusing once again on the practical matters at hand, I noted the expansive driptray area, but was disappointed by its shallow front-to-back depth. Water dribbling over the edges of the portafilter during "wiggle rinses" of the group invariably makes its way past the extent of the driptray and drips over the power switch. Although it has a protective cover, I adopted the habit of placing a towel over the switch when cleaning up the grouphead. The power switch looks neat, but given that most Elektras will see 24/7 operation, it would be smarter to locate it out of harm's way on the underside of the machine beneath the driptray like the Cimbali Junior's. The driptray is designed to route water quickly to a plastic collector container beneath the driptray connected to a drainline. As an experiment, I tried to overflow the driptray by draining the boiler as quickly as possible. It had no problem evacuating the torrent of boiler water. Before moving onto the performance aspects of the A3, some final comments from my wife and friends on its appearance. My wife wasn't enamored to the Cimbali Junior's industrial look, but she warmed to Elektra's showpiece qualities, despite the countertop space it demands. Visitors were immediately drawn to its "over the top" good looks, attractive toggle levers, long activation lever, and contoured matching portafilter handle. The negative comments always came back to its size. Friends teased that I needed a dedicated espresso bar, not knowing that's exactly what I'd do if Elektra were to extend her stay at our house to permanent status. Really, enough about the looks, let's move to what matters: Does the Elektra A3 have as much "go" as "show"? And how does it perform out of the box? The Buyer's Guide series strives to strike the proper balance between technical detail and practical buying advice. Two criteria that have weighed heavily in these evaluations are the morning after score (how easy is it to get the hang of?) and the exceptional espresso score (what can a moderately skilled home barista expect every day?). You may notice that these scores are slanted towards the non-professional, and being Home-Barista.com, I believe that makes sense. After adjusting the pump pressure and then letting the Elektra warm-up for several hours, I pulled a few test shots and was impressed how easily I dialed in the temperature and grind setting for a nice extraction. At the end of day one, I was thinking this was going to be a fun evaluation, although given the amount of money involved in such a purchase, I made a mental note not to rush to conclusions.